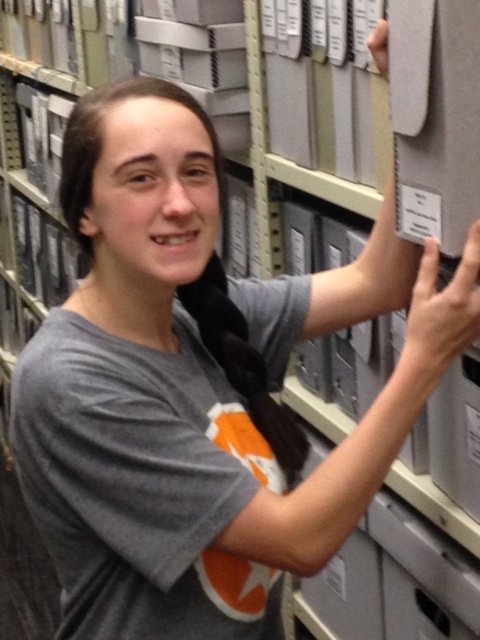 Spring intern Brookelyn Smith of Sumner County, Tennessee. Ebenezer Church of Christ near Tompkinsville, Monroe County, Kentucky. In working on this project, I learned a great many things. First, I learned that the Library Special Collections contains and has access to an absolute wealth of information. All kinds of records, genealogy, maps, posters, artifacts, histories, etc. are held in this library. Beyond that, I learned that there is constant work in documenting this information, organizing it, and making available for the public to see. My internship gave me a glimpse into the formulation of a website and my first encounter with publishing work online. There is a great deal of satisfaction that comes from making local history and information available to the public. In addition, I became interested in looking at the local history of each of these counties. Allen County was particularly interesting to me because my grandparents hail from Scottsville. So throughout the process, I gained insight into the structures within that county. Also, I learned a great deal about the history of that county through reading books to write the historical overview. As a history major, I appreciate this focus on local history, as it is the foundation of our present society. Finally, I had enough time to begin gathering information for a project that will eventually involve creating a biography for Douglas Keen, who was an alumni and member of the Board of Regents at WKU. Beginning this project gave me exposure to some of the history of WKU, which, of course, is very interesting to me as a student of that university. The experience of interning with the Manuscripts unit is certainly one that I will value and remember. I have gained knowledge, skills, and insight from working on the Albert Petersen collection and creating a site for the information, and I am grateful to have done so. I am also very grateful to Dr. Delroy Hire who sponsored my internship. As a graduate of WKU and a forensic pathologist, he continues to support the University in various ways. Under his sponsorship, I was able to gain a wonderful experience, and provide Dr. Hire and others with insight into some of Kentucky’s local history. If a student wishes to obtain information about this internship, they can contact the Department Head, Jonathan Jeffrey, by phone at (270) 745-5265 or by email at jonathan.jeffrey@wku.edu. Recently the Department for Library Special Collections purchased a rare promotional book produced by the Louisville architectural firm of Kenneth McDonald and J.F. Sheblessy. Kenneth McDonald worked as an architect in the Falls City for a number of decades. He graduated with a civil engineering degree from Virginia Military Institute in 1873. While teaching, he worked for the architectural firm ran by his brother, Harry Peake McDonald. 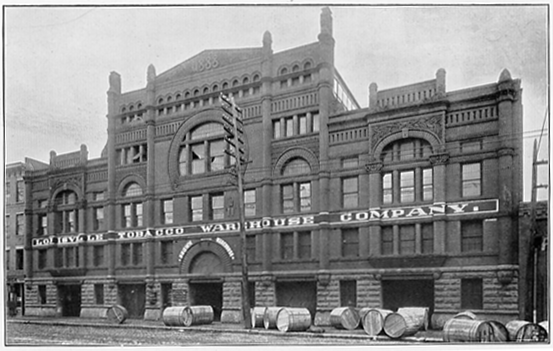 In 1878 the two brothers joined forces under the firm name H.P. McDonald and Brother. When they were joined by two of their other brothers, the firm became McDonald Brothers and enjoyed an enviable practice with commissions from around Kentucky and several contiguous states. The building type for which the firm was most noted was the fortress-like jails built across the Commonwealth. The old Simpson County Jail (now the Simpson County Archives) is the closest extant example of a McDonald Brothers’ jail. They eventually designed over 100 jails in seven states. The main building for the Southern Exposition in Louisville is perhaps their best known design, but one that remains a favorite is the old Presbyterian Theological Seminary (today Jefferson County Community College) which can be viewed from the raised Interstate 65 as one passes through downtown Louisville. In their wisdom, McDonald & Dodd selected Bowling Green limestone as the building material for that Gothic campus. 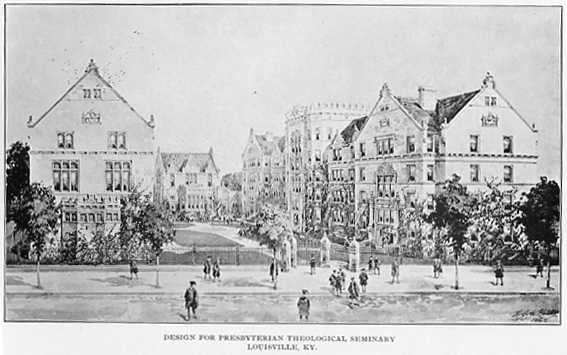 The Presbyterian Theological Seminary designed was designed by McDonald & Dodd. Kenneth McDonald left the firm in 1895 and practiced solo for several years before forming the practice with John F. Sheblessy in 1901. This practice lasted less than five years, for in 1906 McDonald joined with architect William J. Dodd, a partnership that lasted until 1913, when McDonald moved to San Francisco. Sheblessy (1873-1938) moved on to Cincinnati and enjoyed a long architectural career. The brevity of the McDonald and Shelbessy partnership makes this promotional book quite rare. Printing companies that specialized in this specific genre of architectural firm “advertising” were not uncommon, but this book was printed by the Courier-Journal Job Printing Company, again making it a rarity. This book, containing both photographs and drawings, highlights some of the practice’s most important projects, including several churches–most notably Walnut Street Baptist Church, courthouses, residences, commercial buildings, and sprawling government structures such as the East Tennessee Insane Asylum. The booklet also includes twenty-five pages of ads for regional contractors, building supply operators, lumber companies, fixture suppliers, etc. One contractor of note is Peter & Burghard Stone Company whose name is mentioned in captions alongside a number of the photographs as providing the cut stone work for the highlighted projects. Peter & Burghard was known across the south for their tombstones and their other stonework. When Van Meter Hall was built at WKU in 1911, Louisville architect Brinton B. Davis insisted on employing Peter & Burghard as the stone contractor. According to WorldCat, WKU’s Library Special Collections is the only repository to hold this illustrated promotional piece. To see other architectural treatises, drawings, and plan books in Special Collections search our catalog, KenCat. Advertisement J.N. 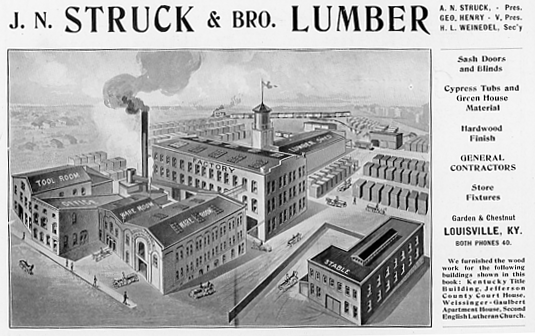 Struck & Brother Lumber Co.
No building could accommodate the crowds that swarmed to these religious meetings. The Reverend John Steele was in the right place at the right time to observe the natal days of America’s Second Great Awakening, a great religious revival that spawned novel methods of worship and new Christian denominations. Reverend Steele (b. 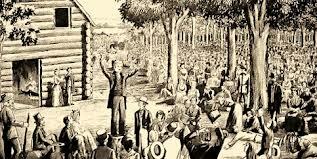 1772) was a minister within the Associate Reformed Presbyterian Church. 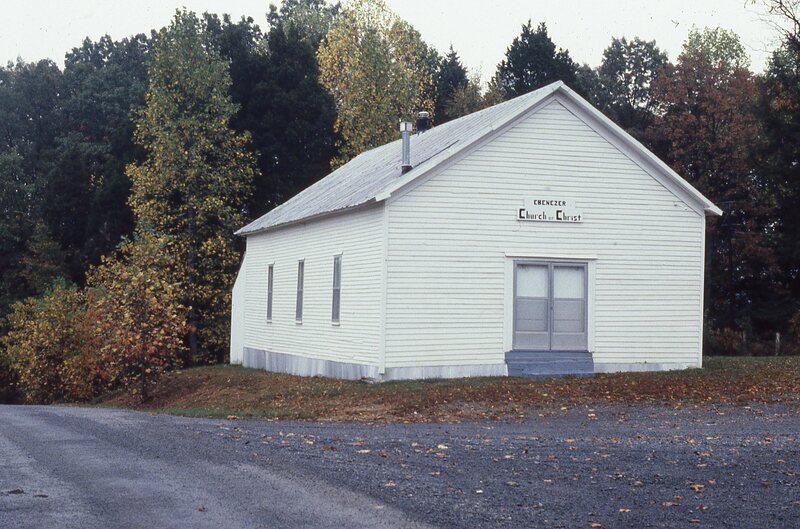 In 1801, he was serving as pastor of a congregation in Bourbon County, Kentucky, when the tremendously influential religious camp meetings took place at Cane Ridge. His religious background provided a unique perspective when he witnessed the events occurring at Cane Ridge. Not fitting his decorous style of worship, Steele called the meetings ones “of confusion and disorder” where “in the same house & in the same assembly you may hear & see people engaged in preaching, praying, exhorting, singing, falling, rising, running, walking, talking, sitting, lying. See people in all positions–in all situations, all exercises at the same time–their united sounds of different voices” making “the Sylvan plain to reecho from afar.” Steele doubted the sincerity and veracity of the erratic worship, telling Hemphill: “I cannot find on what principles I can call it the Religion of Jesus.” After leaving Kentucky in the early-1830s, Steele continued to pastor Associate Reformed churches in southern Ohio. To see other religious related collections in Manuscripts & Folklife Archives search TopSCHOLAR. To see a finding aid for the Steele small collection or view a full-text typescript of the letter click here. 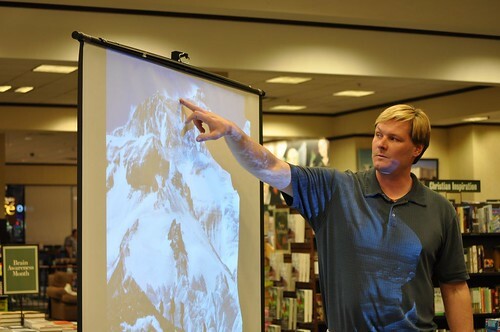 On the evening of March 17 at Barnes & Noble, the WKU Libraries’ “Far Away Places” international talk series featured Professor John All from WKU’s Department of Geography & Geology. While studying climate change in the Himalayas in 2010 as part of the Fulbright Scholar program, he scaled the treacherous northeast ridge and reached the summit of Mount Everest, at 29,035 ft. the world’s highest mountain on May 23rd. Some 371,000 German prisoners of war were held in the United States between 1941 and 1947 including 9,000 in Kentucky. On the evening of February 10, 2011, Professor Antonio Thompson, a historian from Austin Peay University, who recently taught at West Point, talked about how they came to be here, what they did during the war, the problems involved in managing POW camps and their eventual return to Europe after the war at Barnes & Noble in Bowling Green Kentucky. His talk was part of the WKU Libraries’ Kentucky Live! talk series. You may contact the author via email or telephone with any further questions.